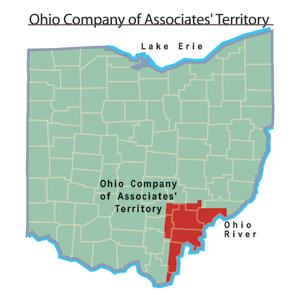 Difference between revisions of "Ohio Company of Associates"
In 1804, the company established Ohio University on the land that it had set aside for that purpose. In its early years, the university only offered the equivalent of a high school education and enrollment remained low. The settlers of Marietta had greater success in establishing a new society once the Treaty of Greeneville, signed in 1795, effectively forcibly evicted many of the region's American Indian peoples from the area. As the population continued to grow in the late eighteenth and early nineteenth centuries, many of the New England settlers found themselves in disagreement with people coming from Virginia and Kentucky who had different visions for the region.